Edgar's Queue is where you'll see what Edgar intends to publish to your social networks. Edgar's Queue displays posts that he intends to publish for you based on your weekly recurring schedule and any posts you scheduled manually for the next two weeks. And he updates your Queue every day. So, today he'll show you two weeks worth of posts from today, and tomorrow he'll show you two weeks worth of posts from tomorrow, and so on. Edgar automatically repopulates your queue by pulling status updates from your Library. After he has published every posts in a certain category, he will start recycling posts that have already been posted (except where prohibited by Twitter). Edgar publishes content in a last in, first out order by default. So, your freshest content gets published first before any older content is recycled. Learn more about changing this order here: Skip and Shuffle Post Order. If a post is showing up in your queue multiple times, you may consider adding more posts to that category or changing your schedule to post from that category less frequently. Learn more about posting schedules. If you've uploaded content and set a Schedule but your Queue is still empty, follow the instructions here: How to Fix an Empty Queue. Clicking the pencil icon on a post in the Queue will allow you to edit it. Any changes you make to a post from the Queue will also be reflected in the Library for future use of that post. When you click the Skip button, Edgar will skip over the current post and replace it with the next post in that category, moving all other posts in the category up one time slot. Clicking the Pause Queue button at the top right of the Queue will stop Edgar from publishing any posts. To resume publishing, un-pause the Queue. Click the Skip button on the post. Edgar will replace that post with another post from that category. Delete the time slot for that post from your Schedule. Learn more about posting schedules. The queue filters at the left side of the page allow you to see what Edgar plans to publish for specific categories, accounts, networks, and more. The Edgar for Instagram mobile iOS app will provide you with a view of your Queue. You can skip posts as well as filter the queue to view one or more accounts. 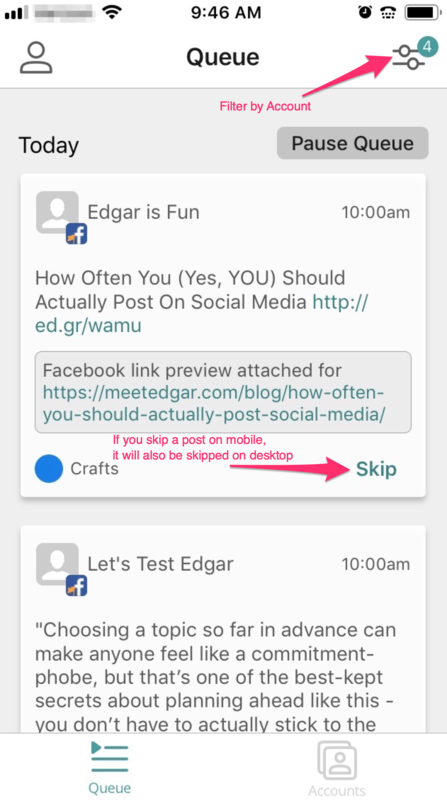 For Instagram posts, Edgar will send you a push notification on your iOS device when it's time to publish a post. Open the MeetEdgar for Instagram mobile app and follow the prompts to publish to Instagram. To add or edit content, make changes to your schedule, or refresh your social media accounts, please visit app.meetedgar.com on your desktop or mobile browser. These changes cannot be made within the mobile app at this time. Need more help? Reach out to the customer experience team by clicking on the message bubble to the right!